Vigitron’s MaxiiCopper™ Vi2301A UTP Ethernet extender brings new performance standards to the growing need for high speed transmission of full bandwidth Ethernet and high-power PoE power over extended distances. Its unique Symmetric Bandwidth (SBW™) assures full bandwidth transmission is maintained over the entire operational distance for both uploads and downloads with Virtual Zero Packet Loss (VZPL™). Bandwidth assurance provides the ability to transmit multiple cameras on single camera runs with no information loss. It can use 1 pair or 4 pairs of UTP and requires no switch setting or network programming. Extended Pass Through PoE (EPTP™) eliminates the need for additional remote site power while allowing a single PoE source, such as a PoE network switch, to provide power to both transceivers and the camera. The Vi2301A can pass through PoE power, up to 74W. Type tested under NEMA-TS2 environmental standards for extended temperature operation between -40°C to +75°C. The Vi2301A is the perfect solution for extended distance data and power transmission for warehouses, parking lots, campuses, casinos, and many more. 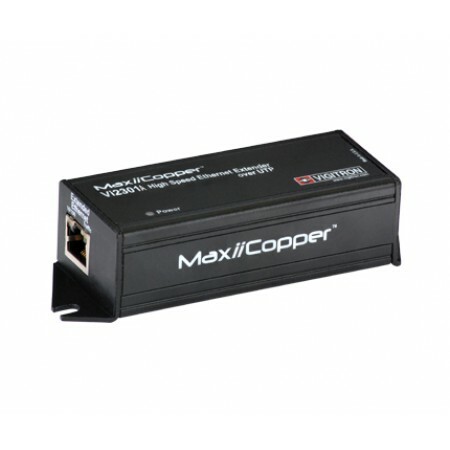 MaxiiCopper’s Vi2301A is low power and can easily fit inside most cameras housing and junction boxes. Best of all, it is MegaPixel Certified (MPC™), type tested to network packet performance standards, and major camera brand compatibility tested to assure you error free and reliable operations. The Vi2300A series is available in single, four, eight and sixteen port configurations to meet every application requirement. Installation cost savings, proven performance, and major camera brand compatibility all go into making Vigitron’s MaxiiCopper™ Vi2301A the best choice for extended distance data and power transmission. *Extends Ethernet beyond 328 feet (100 m) limitation up to 3,000 feet (914 m) over UTP cables. *Requires no switch setting or network programming. *Extended Pass Through PoE (EPTP™) compatible with 802.3af, 802.3at and PoE++ up to 74W. *Mega-Pixel Certified (MPC™) High data rate, ideal for high bandwidth requirements of Mega-pixel cameras, multiple IP cameras systems, and cameras requiring Jumbo Frame transmission. *Symmetric Bandwidth (SBW™) provides consistent upload and download with Virtual Zero Packet Loss (VZPL™). *Type tested to RFC-2544 TCP/IP network bandwidth packet transmission standards. *Supports one-pair or four-pair UTP wires with built-in transceiver cable connectivity tester. *Type tested for -40°C to +75°C temperature range under conforming to NEMA-TS2 testing standards. *Data rate selectable to for maximum bandwidth utilization. *Complies to major IEEE standards and RFC network protocols for UDP, TCP/IP, HTTP/HTTPS. *USA designed and manufactured. *Limited Life Time Warranty.